If you’re like most people, you want to be sure that, once you’ve passed on, no more of your property and money will be lost to the government than is absolutely necessary. You want to know that you’ll be leaving your heirs your assets and not your debts. You want to be absolutely certain that your will is ship-shape, your insurance policies are structured properly, and that every conceivable hole in your estate plan has been filled. And most of all, you’d like to do all of this without driving yourself crazy trying to make sense of the complicated jargon, jumble of paperwork, and welter of state and federal laws involved in the estate planning process. 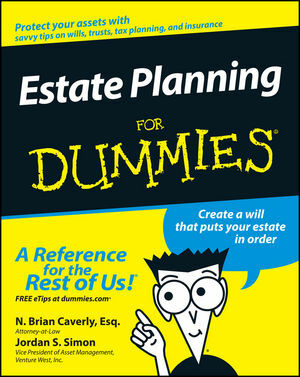 Straightforward, reader-friendly, easy-to-use, Estate Planning For Dummies is the ultimate guide to planning your family’s future. N. Brian Caverly, Esq., is an attorney-at-law emphasizing estate planning and elder law. Jordan S. Simon is Vice President of Asset Management at Venture West, a Tucson-based investment firm. Part I: Estate Planning Fundamentals. Chapter 1: Congratulations: You Have an Estate! Chapter 2: Bean Counting — Figuring Out What You’re Worth. Part II: Where There’s a Will, There’s a Way. Chapter 3: Understanding the Basics of Wills. Chapter 4: Tied Hands and Helping Hands: What You Can and Can’t Do with Your Will. Chapter 5: Probate: Top of the Ninth for Your Estate. Chapter 6: Dodging Probate: Saving Time and Money with a Will Substitute. Part III: Matters of Trust. Chapter 8: Trusts You May Want to Trust — or Not. Chapter 9: Working a Trust Into Your Estate Plan. Part IV: Life, Death, and Taxes. Chapter 10: Preparing for the Tug of War with the Taxman. Chapter 11: The Gift Tax: Isn’t Giving a Gift Enough? Chapter 12: Skipping Around the Generation Skipping Transfer Tax. Chapter 13: Paying or Not Paying the Death Tax: That’s the Question. Chapter 14: Planning to Minimize All Your Estate-Related Taxes. Part V: Estate Planning for Family Businesses. Chapter 15: Grasping the Basics of Estate Planning for Family Businesses. Chapter 16: Transferring Ownership and Paying Estate Taxes in a Family Business. Part VI: Crafting a Comprehensive Estate Plan. Chapter 17: Factoring Insurance into Your Estate Plan. Chapter 18: Connecting Your Retirement Funds to Your Estate Plans. Chapter 19: Estate Planning in Exceptional Situations. Chapter 20: Ten Questions to Get You Rolling on Your Estate Plan. Chapter 21: Avoiding Ten Common Mistakes and Problems in Your Will. Chapter 22: Ten Estate-Planning Resources on the Internet.